Bile is a bitter tasting yellowish or brownish liquid secreted by the liver to aid the digestion of fats in the small intestine. Dog owners often report finding yellow puddles of liquid on the floor or stains of brownish fluid on the upholstery. Often, bile is confused for urine or diarrhea, however, bile does not have a distinct odor as urine or feces, even though some find it particularly foul smelling. But, what is the cause of bile vomiting in dogs and what can you do about it? One of the most common causes of bile vomiting in dogs is due to hunger and excess acid production. This commonly takes place when the dog is left on an empty stomach for too long and is often seen in dogs fed once a day. Typically, the dog will vomit bile in the late night or early morning hours. Owners will wake up and find one or more puddles of yellow or brown fluid on the floor. Normally, the dog seems bright and alert after the episode and remains in good health for the rest of the day. The solution to early morning bile vomiting is to simply give the dog a late bedtime snack or a small amount of food before going to bed. This may prevent the stomach from secreting excess acid in the night which leads to the vomiting of bile. According to Vetinfo, cases that do not respond to a late time snack may benefit from a veterinarian prescription for Tagamet, Zantac or Pepcid AC. These are medications that inhibit the production of acid in the stomach. It also helps to give more frequent meals during the day. Some dogs have sensitive stomachs in the first place. 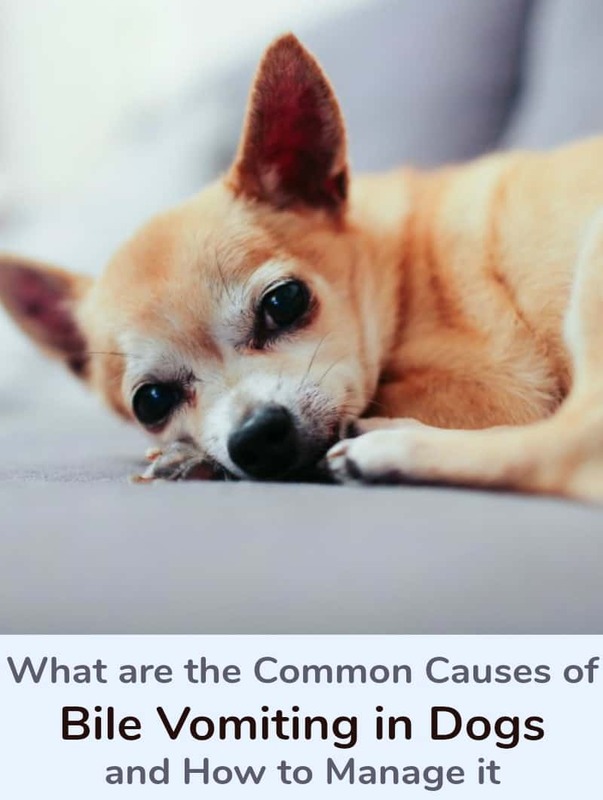 Dogs suffering from inflammatory bowel disease, tend to develop chronic irritation in their intestines which makes them prone to episodes of vomiting and diarrhea, explains Eric Barchas, a veterinarian who lives and works in San Francisco. Such dogs may benefit from a dietary change involving the use of digestible dogs foods specially crafted for sensitive stomachs. Cleaning up bile from carpets and upholstery may not be an easy task. Using a good commercial stain remover for pet accidents or covering the fresh stain with baking soda until completely dry can help. Afterward, vacuuming the baking soda, blotting the area with club soda and cleaning up with a disinfectant spray should do the trick. Vomiting bile can be an annoying event. In most cases, dogs will do fine for the rest of the day and some dogs will even spontaneously outgrow the problem. However, it is best to consult with a veterinarian to properly assess and diagnose any underlying problems. This is very interesting. Blackie, my daughter’s dog, who died a few years ago, vomited bile regularly. Wish I knew then what I do now! This is great information and I really appreciate all the knowledge you share with us!